Chevy In The Hole Before Chevrolet. A postcard of the photo below that is actually labeled correctly. 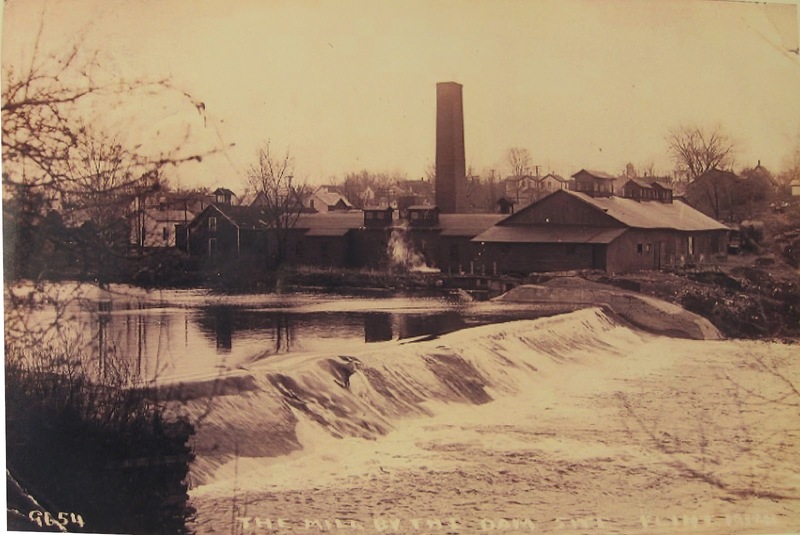 Here is the Fox and Begole mill with the photographer facing south across the Flint river. This location is just west of the Wilcox Street bridge (Chevrolet Avenue now). 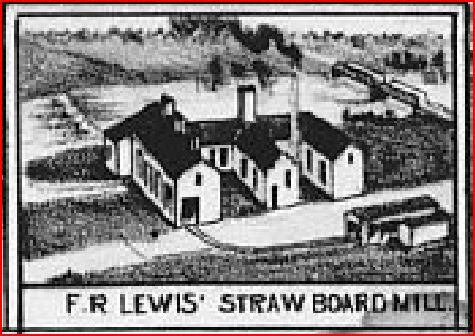 At the time of this photo I believe it had already become the F. R. Lewis straw board factory (shown Below). The location of this mill is shown two photos below. 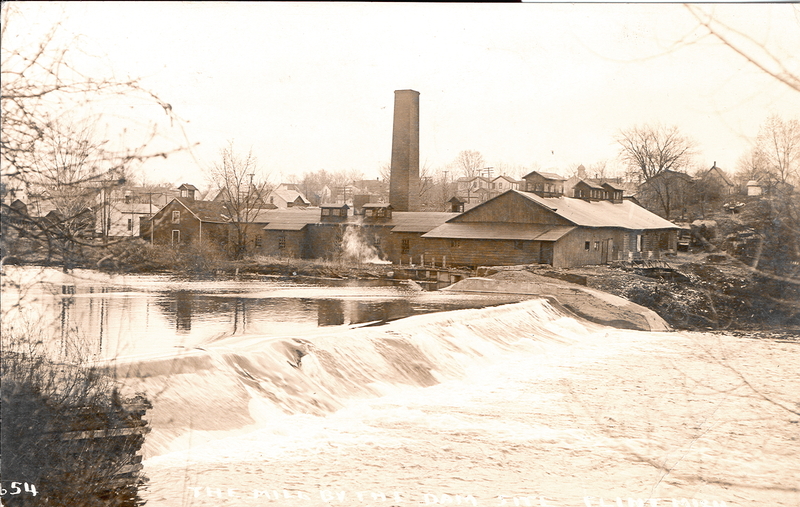 This is most often said to be the future location of the Flint Wagon Works, but that factory was actually built a city block east of this dam, where the Busenbark and Stones saw mill was located. ‘I probably need to do a bit more research’. I’m thinking that Begole probably bought the Busenbark property. I have found that the Crapo mills purchased the Busenbark mill in 1860. The Crapo mills were owned by William Durant’s grandfather. Besides the buildings shown here, there were also more buildings directly east, which were also part of the Fox and Begole mill. This is in fact the future location of Chevrolet factory #5. You can super enlarge just about any photo on this blog for viewing small details. The way this is done is a little different depending on which browser is used. 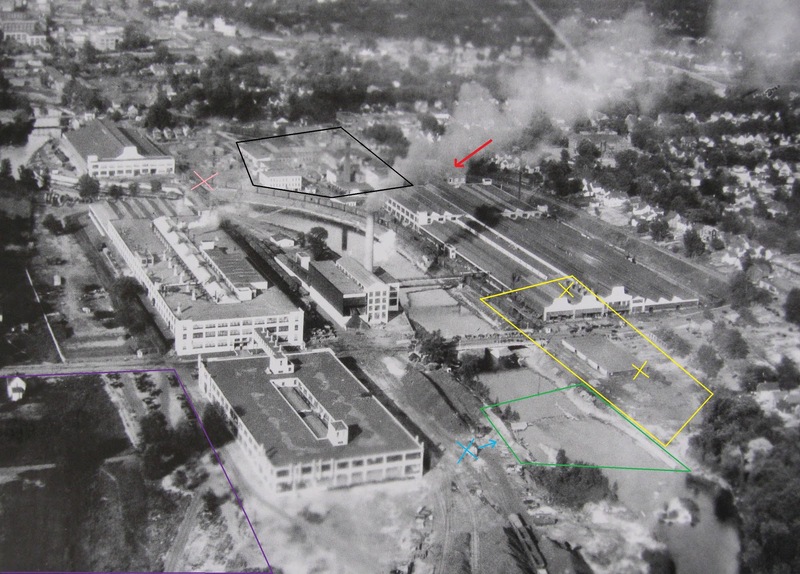 The red arrow shows the location of what is left of the original Buick plant shortly after 1922. The yellow outline shows the location of the Fox and Begole sawmill. The two yellow X’s show where the main buildings were once located. The yellow X in the foreground is where the F. R. Lewis straw board factory was located. At the time of this photo I believe the street had already been changed to Chevrolet Avenue. The area outlined in green shows the remnants of the old dam. The blue X shows where the photographer (in the photo showing the dam) would have been standing when that photo was taken. The area at left, outlined in purple is where the Bernhard Hassellbring greenhouse and gardens were located. This is now the south campus of Kettering University. The 1907 map spells it Hassellbrink, the 1907 maps contain many of these errors. The pink X towards the top is where the Busenbark and Stone’s mill was located. The area outlined in black is the Flint Wagon Works. At this time in the ’20s it is part of Chevrolet. 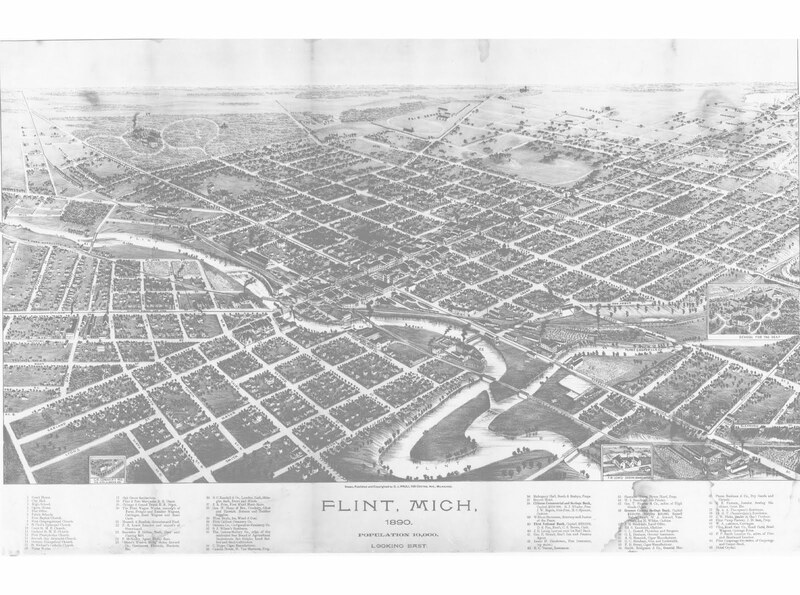 Here is an 1870 view of Flint. You can see the location of the dams and mills at that time. 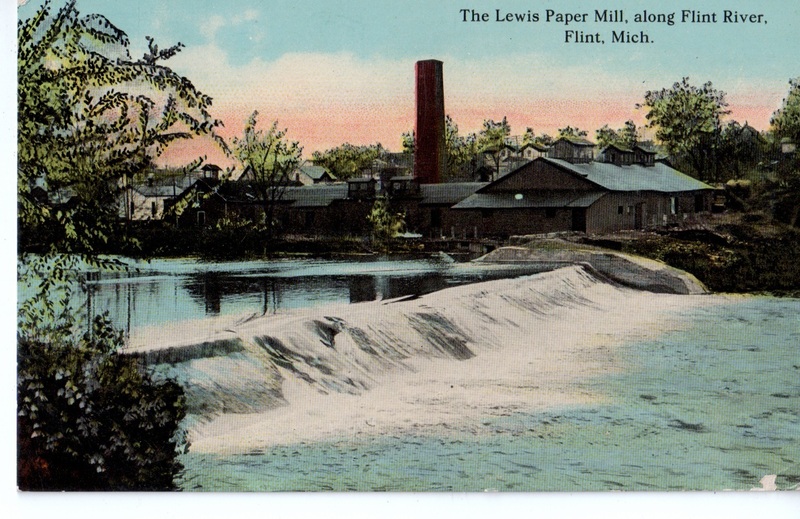 The Stone’s Woolen Mill is shown below after it became Flint Woolen. This is 1894 from the book, Tours Through Michigan, Rail &amp; Water. This is the building where Billy Durant made his start building carts in Flint. This is looking north up what is now Grand Traverse Street. This is the 1907 view of the Chevy In The Hole site. You can see that the dam is still in place just west of the First Wilcox Street bridge. As of 2012 three different bridges have been constructed here. This street would also be re-named Chevrolet Avenue in the ’20s. I think since Third Avenue (to the north) has now been changed to University Drive, that Chevrolet Avenue will soon become Kettering Avenue. 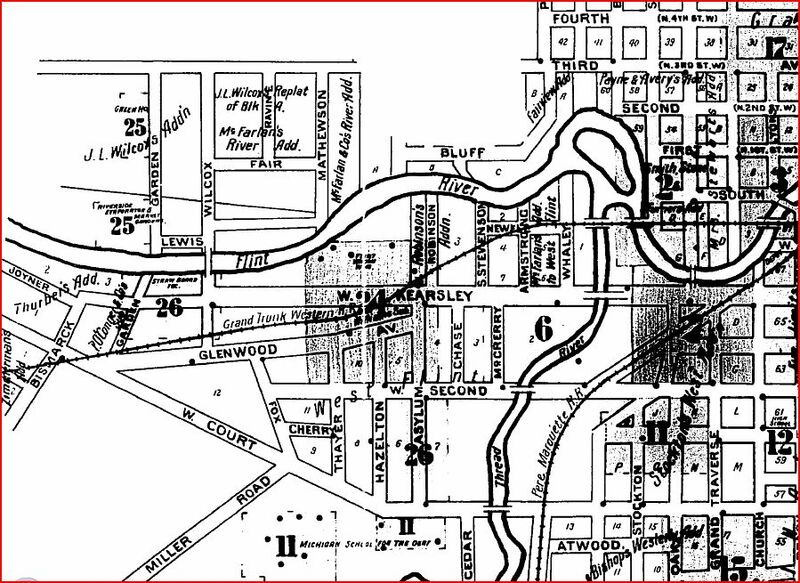 This is the 4th ward of Flint’s west side (also called the “Pinery”) in 1880. The yellow arrow shows the Busenbark and Stones mill. 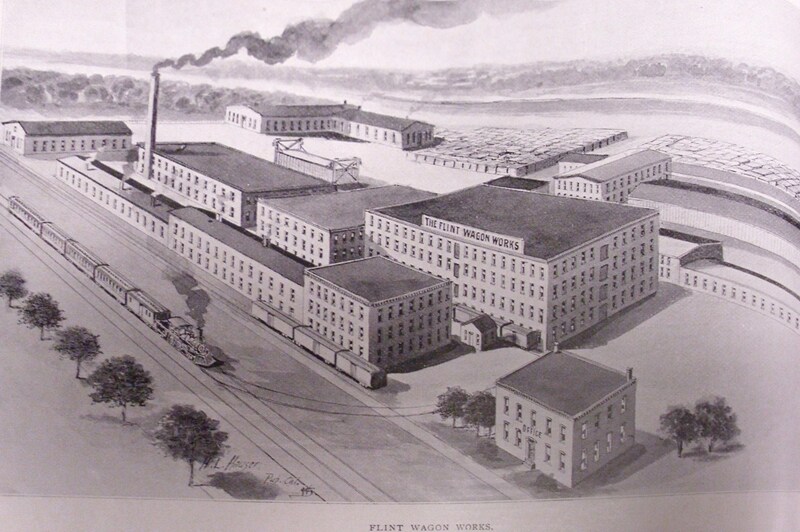 The Michigan State Gazetteer and Business Directory shows this mill still in operation on west Kearsley in 1877. 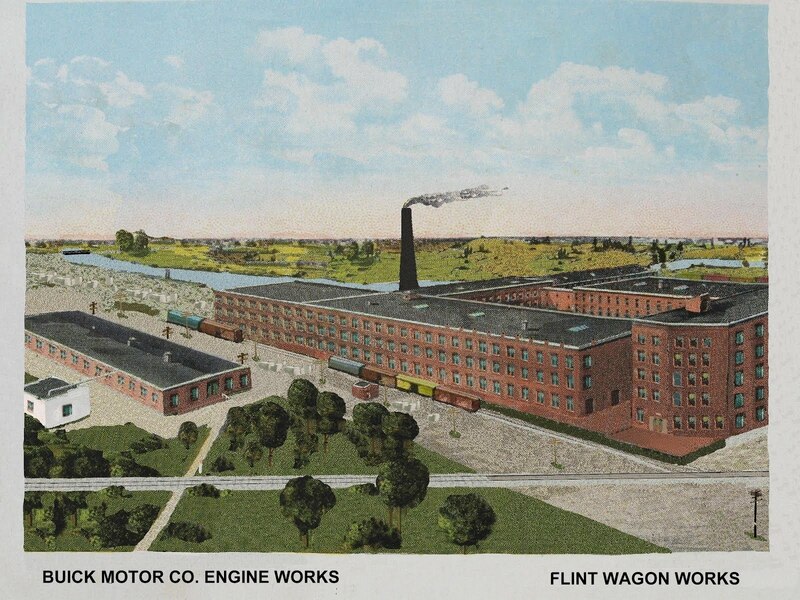 The red arrow shows the future site of The Flint Wagon Works. 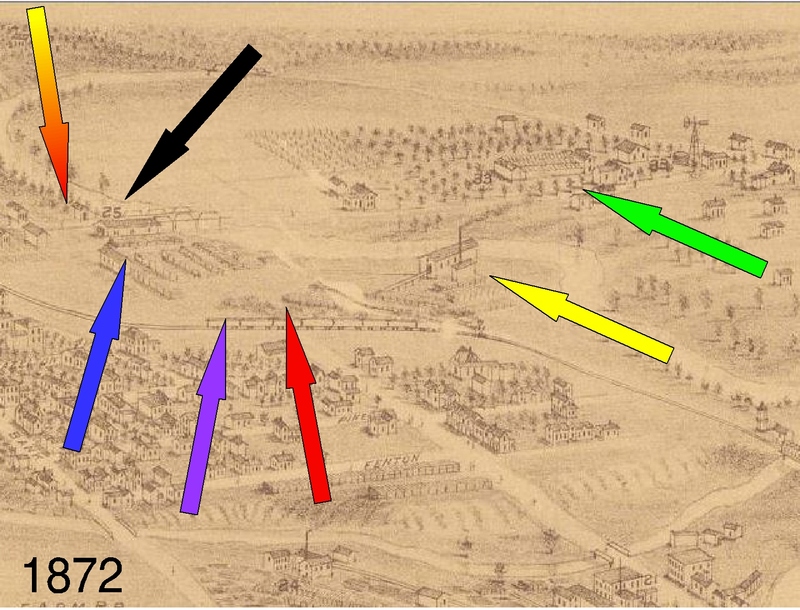 The purple arrow shows the future site of the first Buick factory in Flint. The blue arrow shows The Fox and Begole sawmill which is listed in the Flint City directory of 1882 as being at the foot of Kearsley Street. The foot of Kearsley would have ended at Garden Street at that time. Today there is only a small portion of Garden Street left. 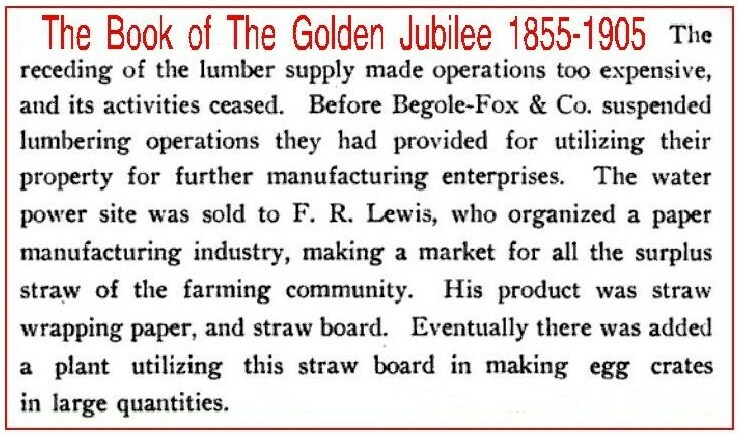 The orange arrow shows the location of the future F. R. Lewis straw board mill, which before the large trees were all gone and shipping costs ate into the profit margin, was part of The Fox and Begole mill. 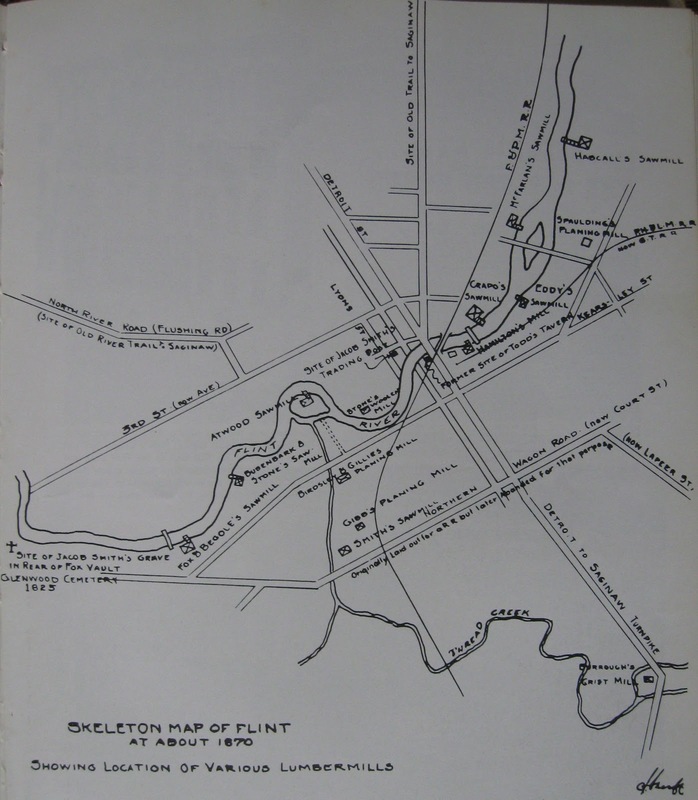 The black arrow shows the location of the last (or lower) dam located on the river in Flint. The green arrow shows the location of the Bernhard Hasselbring greenhouse and gardens. 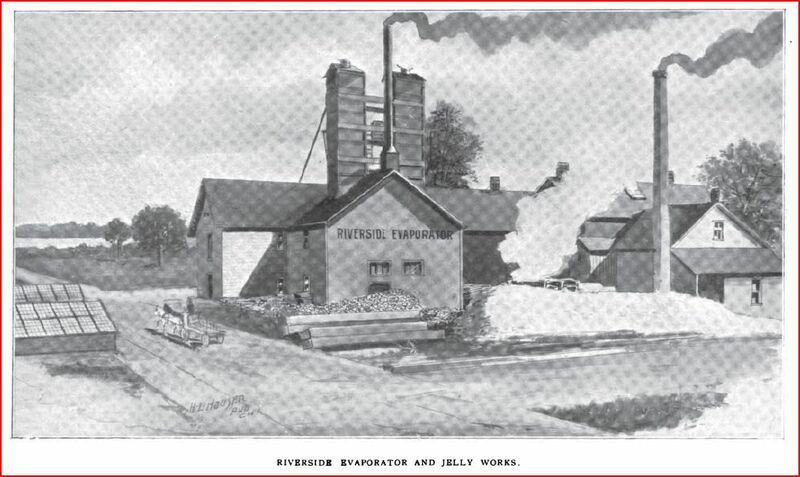 This is also the location of the Riverside Evaporator and Jelly Works which was run by the Wilcox family. 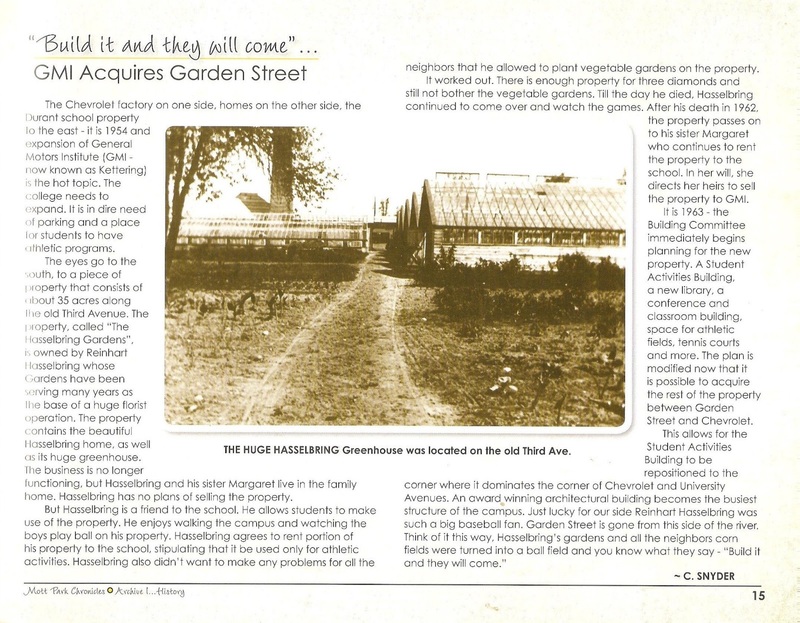 The gardens are where Garden Street got it’s name. The Wilcox family supplied their name for that street. This is now the location of the Kettering Archives. The Hassellbring florist shops were still listed in two locations on Saginaw Street in the 1919-1920 Flint City Directory (shown in my links), you could also buy directly from this location. Originally no bridge existed here early on and only the dam was in place at that time. This view is facing south and shows the greenhouses mentioned above at the left. The Flint river is in the distance with west 3rd ave. running parallel with it in the foreground. Garden Street is going south here with a horse drawn wagon. 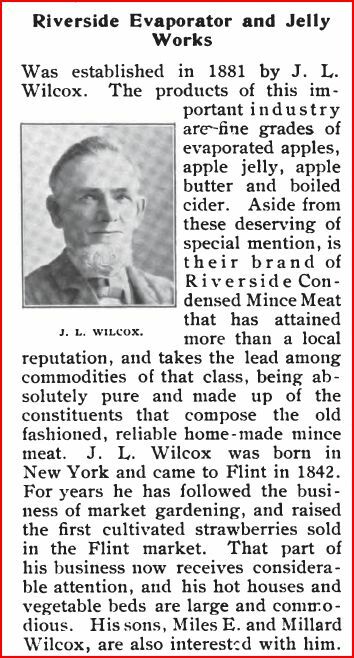 This is from the 1882 flint City Directory and shows Joshua L. Wilcox in the 1st ward and on the west side of Garden between 3rd and the Flint river. This ward would later be joined with the 4th ward. 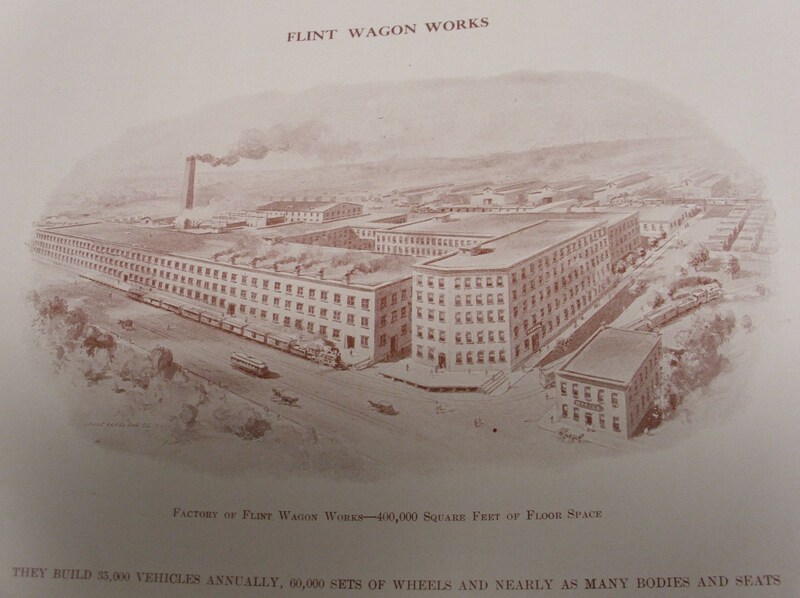 The 1904 Model B &amp; Flint Wagon Works. 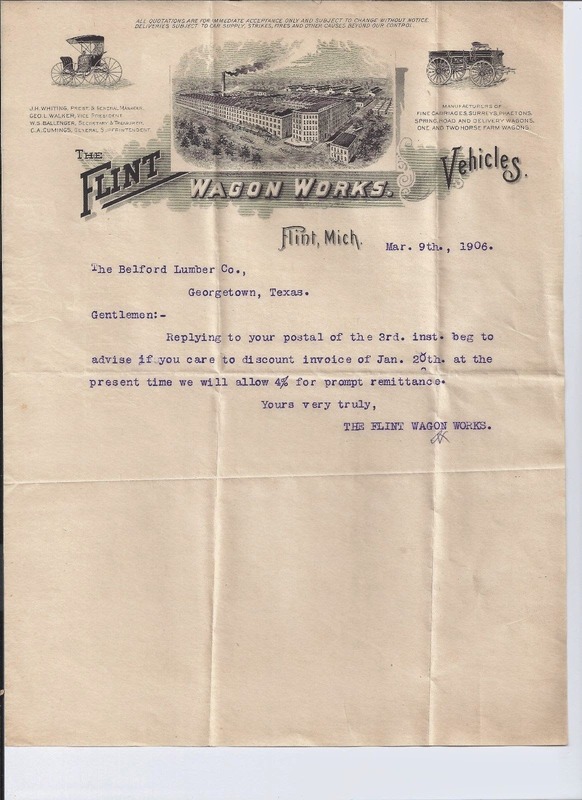 Flint Photos Supplied From The Weaver Family Buick Aerial Views Over 100 Years.